If you have spent any time in Hawaii you are likely to have run into the official state dish, lau lau. It is sold at stands, at stores, and on the streets, though it rarely appears at restaurants. We've seen it sold frozen and freshly steamed from the backs of cars for school fundraisers and in the frozen food aisles of supermarkets. So, when we decided to have a luau out here in Kaleberg Country, we had to make lau lau. There are lots of recipes for lau lau. 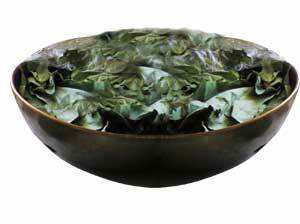 The basic idea is to wrap up a combination of some green vegetable with some salty meat or fish in a ti leaf or two and steam it. Needless to say, there are countless variants. We chose one we had at The Pineapple Room at Macy's at Ala Moana Mall, one of the few restaurants we have encountered that served lau lau. This was a meaty version with pipikailua beef, kalua pork and taro leaves stuffed into ti leaf packets. Here follows the Kaleberg recipe for making lau lau. 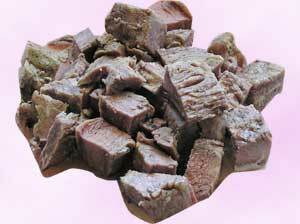 Pipikailua beef is basically Hawaiian pastrami, that is, cured, smoked beef. One tends to think of pork and coconuts when one considers Hawaii, but the big island has cattle country in the uplands where the temperatures are cooler and the grass grows sweet. We adapted Alan Wong's recipe from his New Wave Luau, and we had to start several days in advance because the meat has to marinate in the brining mixture. Boil the water in a big stockpot and add all the salt and spices. Let it boil for a minute and then remove it from the heat. Let it cool to lukewarm. Put the meat in the pot and put it in the refrigerator for 24 hours. Start a small fire on your smoker grill. 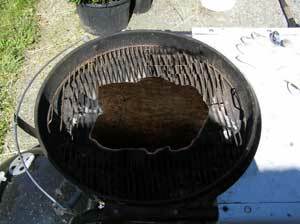 It should cover about half the grill so you have a hot area and a cooler area. Remove the meat from the stockpot and pat it dry. When the fire is horribly hot with glowing white coals, grill the meat over the hot part for ten minutes on each side. Move the meat to the cooler part of the grill and close the lid and smoke the meat for 20 to 30 minutes. The longer you smoke it, the drier it gets. We try to stop when it is still tender, but you can keep smoking it and then boil it in a big pot of rum and water to tenderize it. Kalua pork is what is served at traditional and the better tourist luaus. 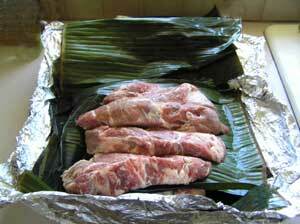 Ideally, a whole pig is wrapped up in banana leaves or ti leaves and filled with hot rocks and buried in a pit to cook overnight. We don't have a pit, we don't have hot rocks, and while we have half a Berkshire pig in our freezer, it was already cut up and we really didn't need more than 3 or 4 pounds of pork. Lightly salt and pepper the pork. Lay out a several large sheets of aluminum foil so that they overlap and will be able to completely wrap all of the pork. Lay out the banana leaf on the foil. Banana leaves are huge. Just use enough to wrap the pork completely. Wrap the package. 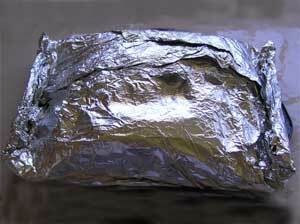 Use more aluminum foil as needed. Fire up the grill for a full size charcoal fire. 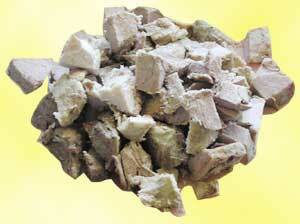 We use Hasty Bake charcoal because it is hardwood charcoal rather than briquets, and hardwood charcoal tastes better. You may be able to find hardwood charcoal at your local store. Let the fire cool from its hottest, then put the packet on the grill and close the lid, but leave the vents open so the fire. After half an hour, flip the packet, and add coals to the fire if it has gotten too cool. You want an oven hot fire, not a cooler smoking fire. Let cook for another half hour and take a peek. It usually takes about an hour for the pork to cook through. Clean the taro leaves and tear or cut them from the stalks. Spin them dry in a salad spinner. Cut up the meat into 1/2 inch chunks. 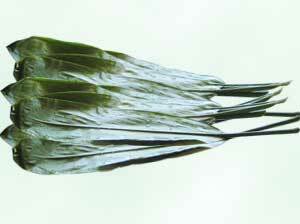 Put a ti leaf on a cutting board and use a sharp knife to cut off the sticking out stalk and about an inch of the leaf. Put a handful of taro leaves, a handful of kalua pork and a few pieces of pipikailua beef towards the fat end of the leaf. Cut about 18 inches of twine and keep it at hand. Roll up the leaf, poking the loose bits back in until you have formed a cylinder. Run the twine around the cylinder the long way and fold down the ends so they are closed. Cross the twine in the middle and run it around the cylinder the short way. Turn the packet over and tie the ends of the twine together to seal the packet. Repeat steps 4 through 8 until you have used up all of your ingredients. Set up the big pot as a steamer with water at the bottom and the rack to keep the lau lau from the water. Steam the lau lau over boiling water for at least 45 minutes. It may take some practice to get the packets to close right. It is much harder if you overstuff. 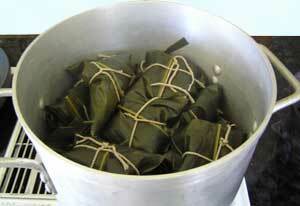 If you want to make bigger lau lau, use two ti leaves each. Cross them at the middle and fold them each inward. Then tie with twine. You can add sweet potato chunks to the mix if you want. In the Seattle area, we get our supplies from Uwajimaya.